We sat down with Robin King, our Grant Services Manager to learn more about how she views her work and what drives her passion for grant writing and funding forecasting. How would you describe grant services? Grant services describe the array of ways we help clients across the entire lifecycle of a grant. We try to match our clients with the grant service that is tailored to their current need. We provide forecasting, project readiness/staging, grant writing, implementation support/compliance management, and evaluation. We have clients that need us to find funding sources that fit their project goals; we have others that need some assistance developing their project ideas, and still others that have been awarded grants but need some help with record-keeping and compliance. We also assist organizations and colleges in the planning, development, and implementation of an annual grant development process. Finally, some clients come to us with clear project ideas and a funding source that fits; these clients request our assistance with the actual grant writing and packaging. We work closely with faculty and staff in developing and transforming ideas into successful grant proposals. How do you build a forecast? In order to produce the most efficient forecast, we need to know the greatest needs of our clients. We meet with them and discuss their future goals, projects, and ideas. We acquire and maintain comprehensive knowledge of their organization to enhance understanding of projects for which grants are sought and to recommend most appropriate sources of funding (type, amount, time span). We conduct research to identify and track potential funding opportunities; these include federal, state, regional, local, and philanthropic. We utilize multiple free and subscription-based websites, email traffic from numerous departments, budgets from government offices, and “insider” information from professional organizations and contacts. New Growth maintains a funding database, and provides timely advice and information on funding opportunities, requirements, and procedures for its clients. Looking into your crystal ball, what are anticipating funding-wise this year? With changes in administration often come changes in budgets and the funding of specific grant programs. While the DOL budget reflects the administration’s efforts to streamline employment and training programs by eliminating or reducing funding for programs that they consider to be duplicative or ineffective, the President did sign an executive order doubling the amount that the government spends on apprenticeships. At New Growth, we predict funding for evidenced-based approaches to job training, such as employer sponsored work-based learning opportunities and on-the-job training coupled with classroom instruction. In addition, the new administration prioritizes school choice and will be funding scholarships for students from low-income families to attend private school. Charter school funding will also be increased, including funding for charter school facilities. Finally, the new administration has consistently emphasized that the Nation’s infrastructure needs to be rebuilt and modernized. Funding should come in the form of targeted federal investments that address problems that have regional or national impact. The government will target sustainable projects that leverage private funds. How do you make the strongest case for funding when writing a grant? Almost every grant application leads with the “needs” section because this is where an organization expresses what critical issue will be addressed with this funding. New Growth utilizes both qualitative (examples and stories) and quantitative (facts, demographics) data that is recent, documented, and grabs the funder’s attention. We also highlight the mission of the organization, which must align with the problem that it is addressing, and the funder’s goals. I love so many things about my job. I love writing, but there is so much more. My job requires organizational skills, attention to detail, the ability to work well with others, and the ability to work under pressure to meet a deadline. I enjoy all of those things, but I probably most enjoy working to improve something. We have all sorts of clients that have wonderful projects and programs that help improve the workforce and impact people’s lives. I love helping them create successful applications to fund those projects and programs. Robin and the rest of the team have developed over $130 million dollars in funding for our clients. 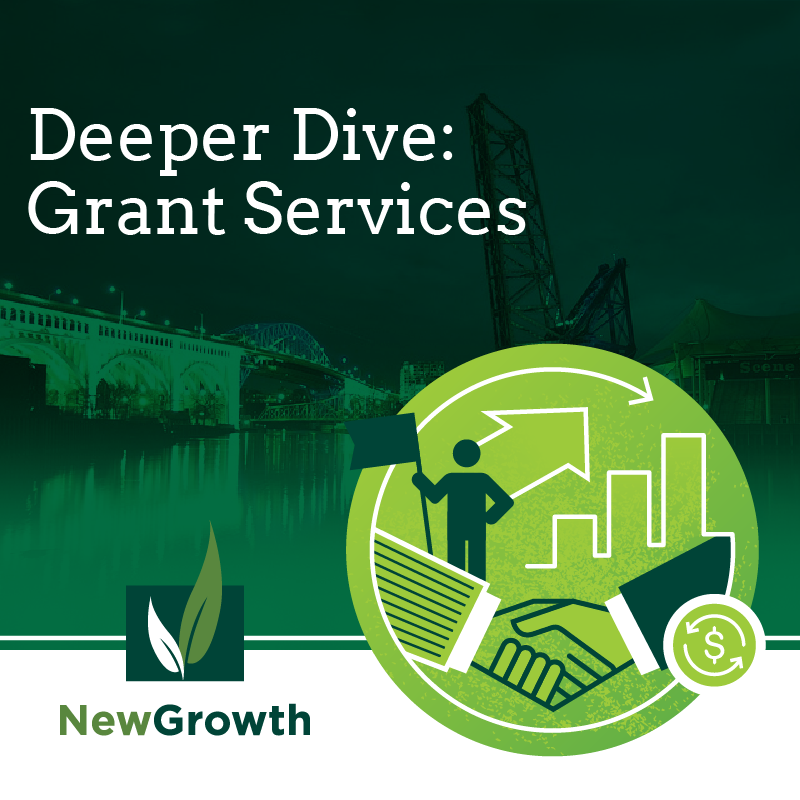 Contact her today to learn more about how New Growth’s Grant Services can help you find the funding your organization needs.